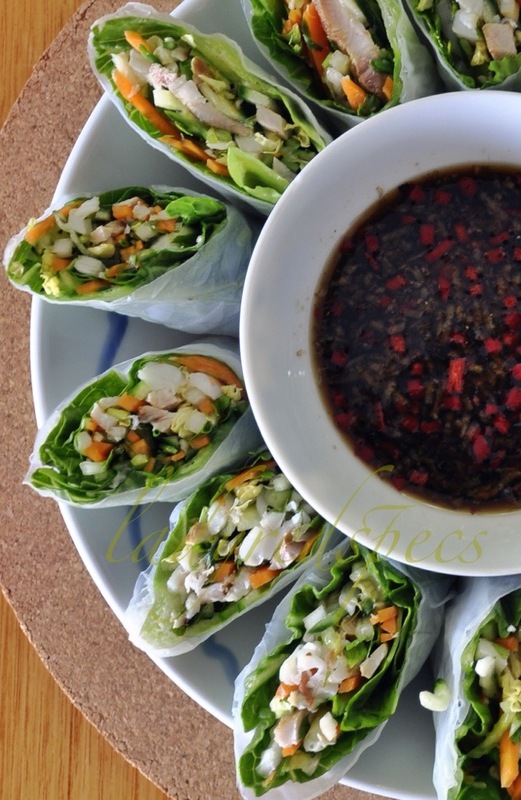 Very early in the life of this blog I posted a recipe for Vietnamese Rice Paper Rolls, the filling my Vietnamese Coleslaw combined with roasted Five Spice Chicken. The photo has been kicking around Pinterest for close to 2 years and is still a regular source of traffic to these pages. Using the leftover meat, carrots and sauce from our meal of grilled Lemongrass Pork inspired this rice paper roll filling, a lively combination of pickled carrots, sweet garlicky pork, some fresh prawn meat, finely cut vegetables and herbs folded into a lettuce leaf then wrapped in rice paper. During my catering days Peking duck with batons of spring onion and cucumber and a dab of hoi sin sauce wrapped into a rice paper roll was a popular canapé. Often the sauce would seep through the rice paper if it was prepared too far in advance so I began using a section of cos lettuce leaf as a barrier. This is still the best way I know to make neat rice paper rolls, but I was surprised recently to read this method in a Vietnamese cookbook. The ubiquitous Nuoc Cham is the perfect dipping sauce for these rice paper rolls, though thinned peanut sauce is also excellent. Cut the pork, prawns and cucumber into long thin strips. Wash and dry the lettuce leaves. Trim off the bottom section of the stem then cut each leaf in half across the breadth. Fill a bowl with a rim wider than the rice papers with tepid water. Concentrate on making one roll at a time. 1. Dip the rice paper into the tepid water until just pliable, 5-10 seconds, then lay it on the bench. 2. Take a section of lettuce leaf and using tongs fill it with the prepared salad. 3. Fold the leaf to enclose the filling, then place it on the edge of the rice paper closest to you. Continue making rice paper rolls until the filling is complete. Don’t let the rolls touch one another while they are fresh as they’ll stick together. Put a sheet of plastic wrap between the layers if you want to stack them up. The rice paper rolls will keep refrigerated covered in plastic wrap for several hours. To serve, cut each roll in half on the diagonal and arrange on a platter. I make a version of these too but would love to try yours. I make them differently every time, it just depends what’s in the fridge! 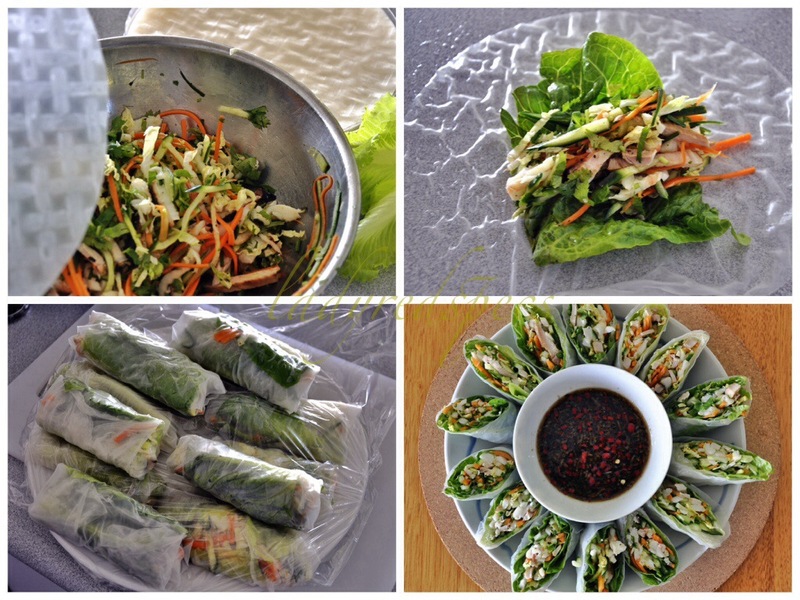 Wonderful looking Vietnamese rolls, and another great summer dish! I like to use a couple of leafy herbs in a similar way, to create a neater roll and to get that bit of green through the rice paper, which can be very pretty contrasting with red carrots and such. Amazing! Seriously, at least once a month I get a craving for fresh “spring rolls”. And with Seattle having a huge Asian population (International District) you just know you can find some really good ones out there…somewhere! I don’t know where though! Just two weeks ago I actually googled it and found a little vietnamese deli and thought “of course!” Went there, picked up four freshly made spring rolls, got home, took one bite and threw the whole lot in the garbage! 🙂 They were horrible! Your rolls look fantastic! What about your dipping sauce? What do you use? Fresh rice paper rolls can be quite bland if not made with a well seasoned filling, but of course the dipping sauce can make or break the experience. My Nuoc Cham recipe is at the bottom of this post http://wp.me/p2frs2-1jw Peanut sauce thinned with a little water is also good, recipe here http://wp.me/p2frs2-Bt Seana, once you’ve made rice paper rolls and got the hang of handling the wrappers, you’ll be able to whip up a batch very quickly. If you plan ahead, and it’s more a summer than winter option, you can make one dinner and morph extras into rice paper rolls for the next day. Yes, perfect for a hot night, it had been 44C the night we had these! Enjoy! Shall copy those! Your inclusion of the double ‘protein’ makes these a much more filling dish and I have never made a double ‘covering’ of both lettuce and rice paper for the mixture ~ find it appealing!!! Thanks Eha,mother were perfect with a cold beer on a hotter than hot night! 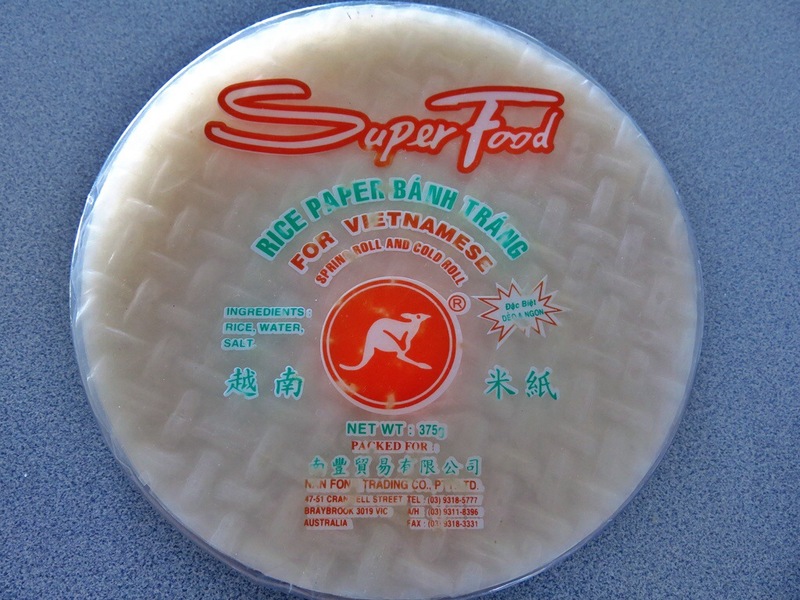 Thanks Shanna, Vietnamese rice papers are incredibly versatile, let your imagination run wild….. Thank you Mimi, delicious in the hot weather too! This entry was posted on January 23, 2014 by ladyredspecs in FODMAP diet, Food, Gluten Free, Light Savoury Dishes, Main Meals, Pork and veal, Seafood Dishes and tagged gluten free, pork, prawns, rice paper rolls, Vietnamese.